The holiday season, intense football and sports playoffs offer greater opportunities for television-watching during winter months. We would be prudent to be mindful of the impact of television watching on overall sedentary time and cardiometabolic risk. Increasing evidence links high levels of sedentary behaviors (e.g., sitting or lying down) with increased risk for adverse health outcomes, including cardiovascular disease, diabetes, cancer, fatal pulmonary embolism and premature mortality. Most concerning is that while high levels of physical activity may attenuate the detrimental impact of most sedentary behaviors, it does not eliminate the increased risk associated with high television-viewing time.1 This is perplexing as we incorporate patient counseling regarding sedentary time in addition to physical activity counseling into our preventive cardiovascular nursing. Analyzing data from the Coronary Artery Risk Development in Young Adults (CARDIA) study, daily time spent in six self-reported sedentary behaviors was calculated. The sample included 3,010 black and white adults. The sedentary behaviors were: (1) watching television; (2) computer use; (3) doing paperwork; (4) listening to music, reading or doing arts and crafts; (5) talking on the phone or texting; and (6) sitting in a car, bus, train or other mode of transportation. An objective measure of visceral fat was calculated using computed tomography (CT) scans. Only television watching was associated with visceral fat. The study found that for each additional 1.5 hours of television watched, visceral fat was greater by 3.5 cubic centimeters, even among those who were physically active with a normal body weight. When statistical models were constructed to determine independent and joint associations of sedentary activities with cardiometabolic risk, replacing 2-hours of television viewing with 2-hours spent in any other sedentary activity was associated with significantly lower cardiometabolic risk score.4 These findings are consistently suggesting that overall, television viewing has a more adverse association with cardiometabolic risk factors than other sedentary behaviors. 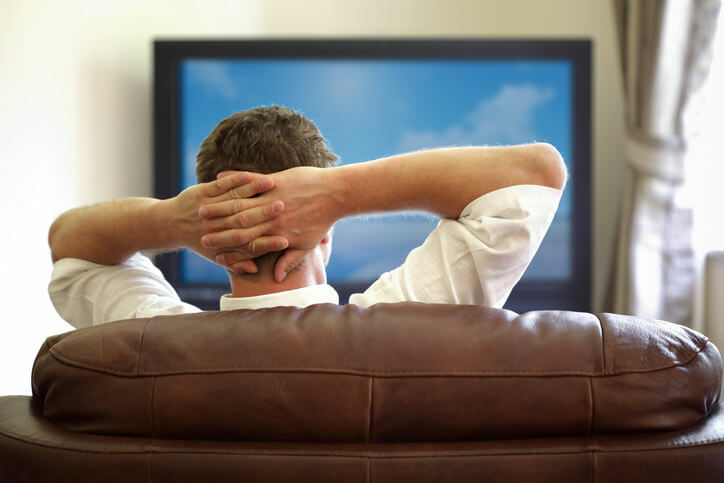 There are several things to consider when trying to untangle the role of television viewing on intraabdominal fat. Whitaker et al2 suggest these might include the fact that television viewing time is easier to remember compared to other sedentary behaviors thus it may be over-reported compared to other sedentary activities, or that television watching may be associated with less movement (posture change, fidgeting, more reclining, etc) than other sedentary behaviors. Another consideration is the tendency to snack on high calorie and less nutritious food and beverages during television watching which is enhanced by the many advertisements. Implications for preventive cardiovascular nurses may be to ask patients about usual and seasonal time spent in television watching. With this assessment, counseling can be provided regarding both the reduction in television viewing time and the need to increase movement and frequent position changes, i.e. standing, light exercise, during that time. Encourage both awareness of and avoidance of habitual or social eating during television watching which may patients off the path of heart healthy nutrition. Ekelund U, Steene-Johannessen J, Brown WJ, et al. Does physical activity attenuate, or even eliminate, the detrimental association of sitting time with mortality? A harmonised meta-analysis of data from more than 1 million men and women. Lancet (London, England). 2016;388(10051):1302-1310. Whitaker KM, Pereira MA, Jacobs DR, Jr., et al. Sedentary Behavior, Physical Activity, and Abdominal Adipose Tissue Deposition. Medicine and science in sports and exercise. 2017;49(3):450-458. Shah RV, Murthy VL, Abbasi SA, et al. Visceral adiposity and the risk of metabolic syndrome across body mass index: the MESA Study. JACC Cardiovascular imaging. 2014;7(12):1221-1235. Whitaker KM, Buman MP, Odegaard AO, et al. Sedentary Behaviors and Cardiometabolic Risk, an Isotemporal Substitution Analysis. American journal of epidemiology. 2017.